The latest statements by Nazri Abdul Aziz concerning the ongoing APCO saga only adds to the strangeness of the whole issue. At a press conference in Parliament on December 22nd, the de facto law minister triumphantly displayed a letter from a Mr. Robert Shrum who attested that APCO had nothing to do with the One Israel policy of former Israeli Prime Minister Ehud Barak. Opposition leader Anwar Ibrahim has been relentless in his allegation that Najib’s 1Malaysia policy is in fact based upon a similar policy that APCO created for Israel. So who is this guy Robert Shrum? Where did he come from? Why is his letter now being considered the final word on the APCO saga? Apparently, he is a relatively minor America political consultant who has also worked for former Israeli Prime Minister Ehud Barak. It would not be too much of a stretch to imagine that APCO conjured up this latest maneuver. So now we have a letter written by a former consultant of an Israeli Prime Minister supporting a company that used to work for Israel being used to support the case of a government that is trying desperately to distance itself from any connection with Israel. How confusing and convoluted can that be? And if that’s not enough, there is APCO’s connection with ASERO Worldwide, a security consultant with ties to Israel. One of the members of ASERO’s executive leadership worked for the Israeli Security Agency. Politics is as much about optics as anything else. In Malaysia, Israeli connections do not go down well with the electorate. Like in other Muslim countries, taking a strong stand against Israel is always the popular thing to do. Besides, there is a noticeable streak of anti-Semitism in Malaysia’s body politic. 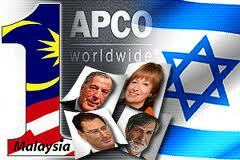 In practice, however, Malaysia deal with the Israelis when we have to and when it suits our interests. Israeli sporting teams have visited Malaysia from time to time and our ministers have met with their Israeli counterparts whenever the need arose. This would not be the first time that we have hired lobbyists with links to Israel either. During the early years of the Bush Administration, Greenberg Taurig was retained to represent Malaysia in the US. Greenburg Taurig has extensive connections with Israel. Most American firms do. If we opt to do business only with companies that have no links to Israel, we would probably have to limit ourselves to North Korea. And let’s face it: they are not exactly ahead of the curve in the PR battle these days. It may or may not be true that there is a connection between 1Malaysia and 1Israel. It may well be just a coincidence; after all, nothing is original anymore in the 21st century. And whether or not the company that designed the program has an Israeli connection shouldn’t matter too much. What matters is whether the program is good for us and how it can serve the nation’s interest. On the surface, it sounds good enough. Who can argue with national unity, racial and religious harmony, moderation and cooperation? The problem with these slick public relations exercises is that it is invariably about form rather than substance, about presentation instead of real steps forward. In many ways, it is an exercise in deception, an attempt to influence perception, a chimera. If APCO can help the government develop policies that bring about real change that would meaningfully enhance national unity, realistically position Malaysia in the global economy and enhance our image abroad, more power to them. What we don’t need is another foreign public relations firm hired with tax-payers money to deceive tax-payers into thinking that everything is going to be alright.